All nutritional patterns are based on concept of the food pyramid. It divide foods into several layers, like a pyramid. Aliments at the bottom levels are the most important and need to be consumed every day (even more than once a day), on the other hand food at the top is less important (when not dangerous) and its consumption must be very limited. Unfortunately, food pyramid has some flaws to be aware of. First flaw is undoubtedly the way in which food is classified into “good” and “less good”. Not for every person food has the same importance or it can be defined good (i.e. milk is important for lots of people but for those who are lactose intolerant. That means also non-personalized eating plans. 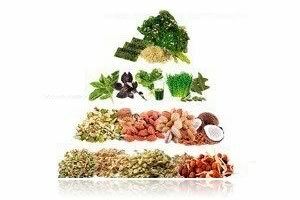 Although food pyramid is a way to represent rules that should govern our usual intake of food, they are sometimes touted as solutions to ensure an optimal life in terms of health. Some modern versions of the food pyramid includes also sport and indicates exercises as one of the (lower) levels of the pyramid. Another flaw is that foods at the same level are considered to be equivalent, but often food pyramid put into the same layer different kinds of food, such as meat/fish and all kinds of fruit. Yet, it is quite different to consume a slice of salmon steak rather than chicken or exchange a salad of strawberries with a bunch of bananas. In conclusion we can say the model based on the food pyramid is still a good solution to take into consideration regardless of the pyramid itself. It is a classic short-cut solution, easy to understand and apply, but that does not lead to a real knowledge growth of best food for our own person.